The elder daughter attended her school Christmas party just the other day in a red bubble dress. I bought the dress in October but told her she'll be wearing it in December. Glad the wait is over because she has been very excited to wear it. If I'm not mistaken, she asked my permission to wear her party dress in three of different occasions and I explained why she couldn't every time. The DIY flower headband matches her dress perfectly. A photo op with her teacher. Another photo op with her classmates this time. What she wore: Nina Collection bubble dress, DIY headband, Pitcheco tights and Natasha boots. I am looking for a new Blogger template these days. 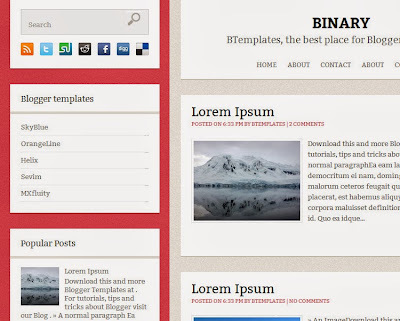 As usual, I first checked my favorite free template website, Btemplates.com. I used to have this magazine template somewhere between 2010 to 2011. Now I am thinking of taking it back, though I am not sure if I still know how to customize it. I want a template that has a feminine color. It should show at least 4 to 6 latest posts. The sidebar must be medium. Lastly, it should be easy to tweak. I know there are some affordable blog designers out there. It's not that I can't afford to pay one. I am just being stingy. However, I will be very proud of myself if I can find a template that suits my taste and improve it without someone else's help. I am currently craving for this. It's one of my favorite Filipino snacks when I was a still a kid was. In the province, people normally used rice flour when cooking it but later switched to regular flour for convenience. I remember a relative frying her maruya in jackfruit leaves to stop it from sticking to the pan. Thanks to whoever invented teflon pans. My banana fritters look perfect and yummy. 1. Cut the bananas into small cubes. 2. Mix bananas, flour and water. 3. Divide the batter into small portions. 4. Form into patties and fry until golden brown. If you think 2 bananas are not enough. Just double every ingredient and you're good to go. Happy snacking! It's strawberry season in Baguio. Hubby wants to go up and visit the city for the holidays while the elder daughter is craving for some pink smoothies. What should I do? I did not approve the long ride because of our little baby, plus we already have a reservation in a Tagaytay hotel. 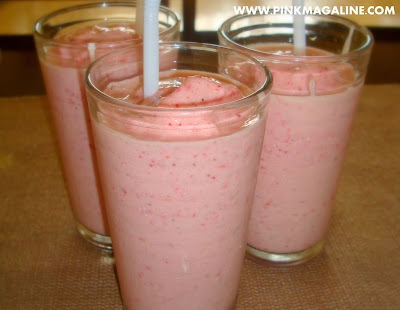 I guess I better buy some strawberries and make our all-time favorite strawberry-yogurt smoothie, right? Procedure: Put everything in a blender. Blend until smooth. Serve in tall glasses and enjoy. One of the rice meals that I normally cook at home is tuna paella. Hubby tasted a certain brand of canned tuna paella and liked it so I thought I'll home-cook them to satisfy his craving. Besides, he prefers the freshly cooked tuna paella than the canned one. 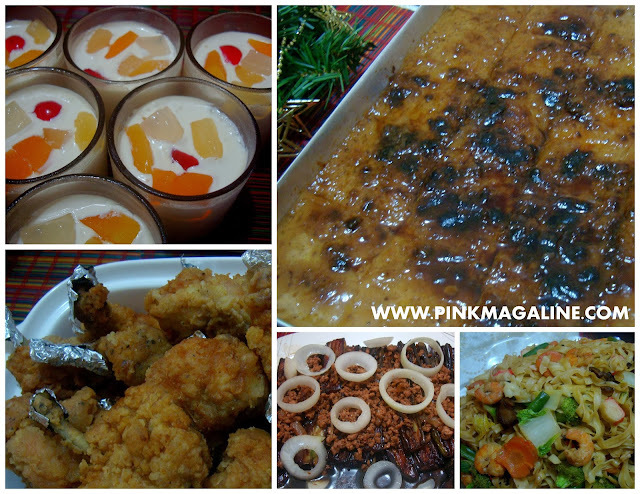 I'm already done with my Christmas menu but might as well add this to the list. -Put the achuete seeds in a bowl with 1/2 cup water. Let stand for 3 minutes. Rub the seeds to extract color. Drain the seeds away and set the achuete water aside. -Saute garlic and onion in a pan until brown. Add mixed veggies and spring onions. -Combine glutinous and organic rice. Wash them well. -Pour the remaining olive oil from the San Marino can and 2 1/2 cups of water to the sauteed tuna and vegetable mixture. -Add the achuete water, saffron and salt and pepper according to taste. -Mix well then cover the pan and let the paella set until cooked. Note: To improve the taste of your paella, you might want to add green and red bell peppers. Instead of carrot and corn alone, you may use mixed vegetables (the one with green peas). Also, substitute leeks with spring onions or prawns and clams instead of fish. *This recipe is good for 8 people. I am now down with Cristmas Present #2. So what did I get? 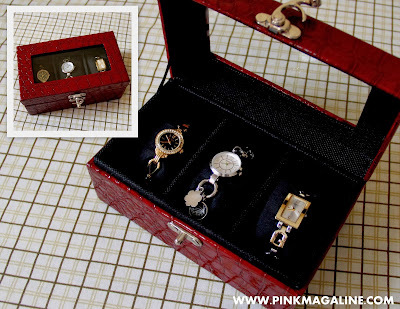 It is this very lovely watch box. I like it a lot because it looks classy and expensive. I am now using it to organize my watches. Below you can see my Cherie watch, Fossil charm watch, and Guess watch all neatly kept in the box. Thanks to my college friend named Josh who gave this gift to me. This watch box has 3 compartments so I guess that's a sign that I don't need a new watch to add to my collection. What I am thinking of buying at the moment is a set of affordable pearl earrings like those mikimoto designer jewelry. Pearl is my birthstone so I really feel the need of owning a south sea pair. Any idea where to buy them? Gotta love Christmas. It is the best time of the year. My favorite holiday ever. This year, I am taking notes of all the lovely gifts I receive for the season. 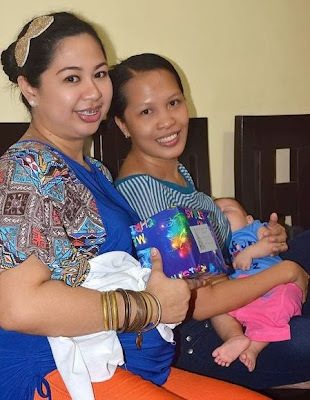 First is this sheer white top which a blogger friend gave me during the Fab Moms Christmas party. I wished to get a stylish white top and it was just granted. Thank you Bedalyn dear for this one. I haven't worn it yet but I'm sure it will be used a lot once I gained confidence in wearing white sheer tops again. Shhh.. I am still a little chubby and need to lose more weight after pregnancy. So I guess you understand what is this post all about by merely reading the title. Yes, I am Turkish. Well, not really, but yes I am. Hahaha! Kidding aside, I was granted Turkish citizenship this year. I received my Turkish ID in June through the Turkish embassy here in Manila. Some people ask how come I call myself as Turkish when I absolutely do not look like one. For those who do not know me yet, I am married to a Turkish man that's why I was able to get Turkish citizenship. My orange card with me wearing MAC Lady Danger in the photo. I love being a Filipino. However, I needed to claim my right as Turkish for the sake of my children and our entire family. Also, we might go back to Turkey for good so my next step is to get a Turkish passport. In the meantime, I am planning to buy some specialty paper and start working on my new DIY calling card. I made my first card in 2011 and was quiet impressed with the result. I don't have same old template anymore. Now I'm looking for a new one. Saw these cheap business cards from zoo printing and got an idea on how to improve my card. Will show you the end result once it's done. The elder daughter used to fear Saint Nicholas. She would agree about taking photos with Santa but cried after seeing him up close. I don't know what's wrong with Rudolph's boss that some kids are uneasy beside him. Anyway, I am glad that my firstborn finally conquered her fear of the big guy. This photo was taken last year. See that expression on her face? Haha. 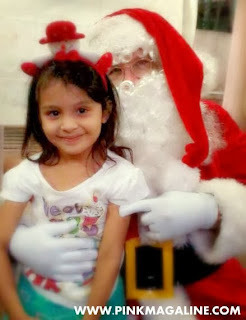 This is her photo with Santa taken just recently. Pretty smile this time huh. Christmas day is fast approaching and I am sure we will stumble on Santa somewhere again. I remember way back 2005 when my husband and I were still dating. He revealed to me that Santa was Turkish and I couldn't believe it. Later on I learned that he was actually a Christian saint and a bishop in an ancient Greek town called Demre, now part of Antalya in Turkey, contrary to the belief that he is from the North Pole. The image of Santa these days do not match the original saint. He wasn't overweight and he didn't have white hair and beard. Although he was said to be very kind to children, it is not true that he has elves working for him, making toys to be delivered through the chimney to all children all over the world. Red, itchy, and puffy eyes.. I hate those! Sore eyes plagued my family for weeks. 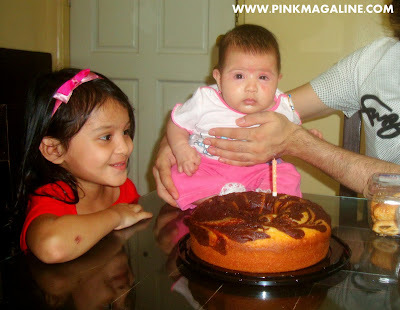 It started with my husband to my elder daughter, from the elder daughter to me, then lastly to our little baby. She would wake up with her left eye closed because of pus. Her right eye got infected, too. They became so itchy that she scratched so much until her face turned red. 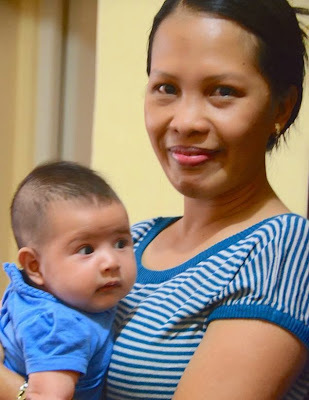 Here is a photo taken on her 4th month birthday with red and swollen left eye. I am glad that we have a kind pediatrician who right away replies to my text whenever I need help like if the kids are sick and do not know what to do. She recommended Terramycin eye ointment for faster healing. I just had to wait until the next day to buy the said ointment 'cause the pharmacy in our block doesn't operate 24 hours. I wish we have online drugstores in the Philippines like http://www.tcds.com/ in Canada. It can be very convenient and hassle-free to have medicines delivered to your home. In any case, it is really hard for me to see my children getting sick. I always remind my husband and elder daughter to wash hands once they come home from office or school in order to prevent any germs or virus to spread in the family. Before actually thinking of a remedy for my elder daughter's old Barbie ballet flats, I first tried to figure out how to make a hair accessory that would match her Christmas dress. I have this stash of used and excess ribbons in different colors, width and texture. I keep them in one plastic and would recycle them into headbands or use them as decor for presents and other stuff. I have this flower headband as my newest project. 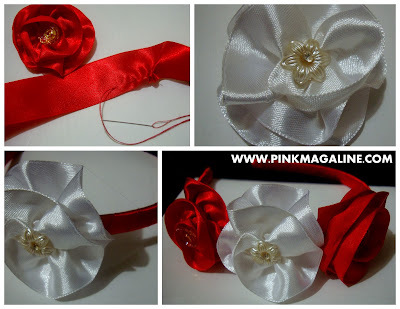 The photo above illustrates the process in doing this Christmas-inspired headpiece, a flower headband which my elder daughter loves so much. She will be wearing it at school this coming Wednesday. I am sure it will look pretty together with her red party dress. I have another headband finished together with this one but will show it in a separate post later. Looking at our Christmas tree this afternoon while breastfeeding my little baby and adoring those red and gold ornaments that hang on it, I couldn't help but ask myself if I am all set for Christmas. I am 90% done with shopping, my Christmas menu is ready, and we started delivering most presents for friends and family. 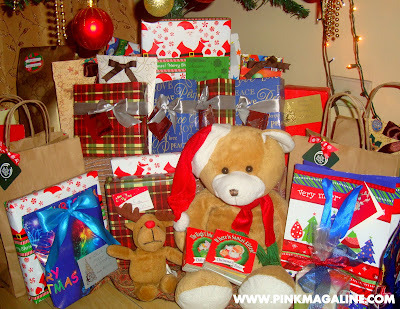 Majority of the presents left under the tree are for my elder daughter's classmates and friends. Some of them are for my friends and the rest were given to us. Gotta keep in mind that I need to visit the nearest mall at least once before the holiday break in order to get something special for hubby. Discount offers are everywhere in December and they can be very tempting. However, my husband is a little choosy and unpredictable. Honestly right now, I still do not know what to buy for him. He works as a programmer and website or software developer so he's more of a gadget and technical person. He doesn't like perfumes or accessories. Clothes don't stay long in his closet and he gets easily tired of them. Ahh.. any gift-giving tips and ideas? I heard about domain authority today and thought I need to read more about it and what does it mean to my blog site. I'm happy though that my knowledge when it comes to SEO is improving little by little. Back in 2005 when I started blogging through Xanga, it was only as simple as keeping an online journal, writing poems, letters and stories. I moved from Xanga to Friendster, then later on from Friendster to Blogger. 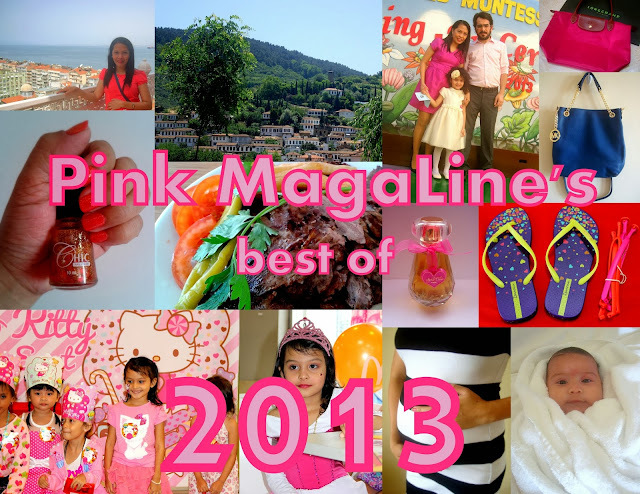 Fast forward to 2013 and here I am, a proud owner of Pink MagaLine. I am not a famous blogger but I am satisfied with my own progress, looking back to all the trial and errors, considering the number of blogs I owned and all. 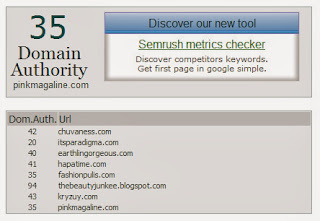 Domain authority checker Moonsy.com says www.pinkmagaline.com has a score of 35. I also checked blogsites that I frequently visit and saw their scores. 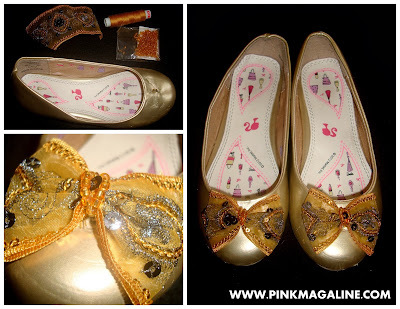 I bought this gold pair of Barbie ballet flats for my elder daughter to wear on her 5th birthday. It used to have jeweled bows but they fell off easily. Hubby saw it and he decided to pull out everything, leaving the shoes bare and looking unpleasant. I was supposed to buy a replacement for my daughter to use for her reading recital. I couldn't find a pair that looks very similar so. As a remedy, I cleaned the old ballet shoes, brought out a gold ribbon, a brown thread, some beads and a glue gun. I made a couple of bows then sew and glued them to the Barbie shoes and viola! Now my elder daughter has shoes that matches her Greek costume perfectly. Happy that I was able to recycle something instead of throwing it. Not to mention, I was able to save money too. 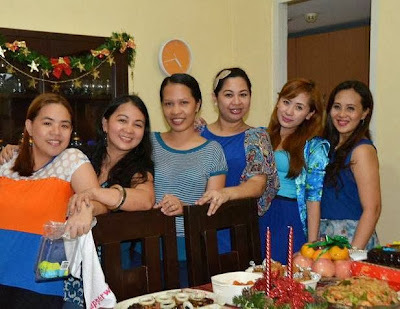 If not for Fab Moms' Christmas party, I wouldn't think of putting up our tree and decorate it as early as November. Honestly, I was feeling a little down and didn't feel like celebrating yet because of Typhoon Haiyan. Later on I realized that no matter how devastating Yolanda was and no matter how frustrating the news I hear everyday, I still need to put up our tree and prepare for the merrymaking. In my mind, I became hopeful that things will eventually turn out fine. This is how our tree looks like with the lights on. It's only 5 feet and its theme is same as last year-- red and gold. This tree is the same old tree we used almost 4 years ago. I wish to buy a bigger tree next year and use white decors. Also need to glam up our living room with some accent and display lights. Nonetheless, there's still 13 days more to go before Christmas. Aside, from the tree, I also hung a garland at the dining area, a wreath by the door, and then a centerpiece following the same theme. I think that's all and we're ready. How about you? Is your Christmas tree up? Are you done hanging all the ornaments? Tell me about it. 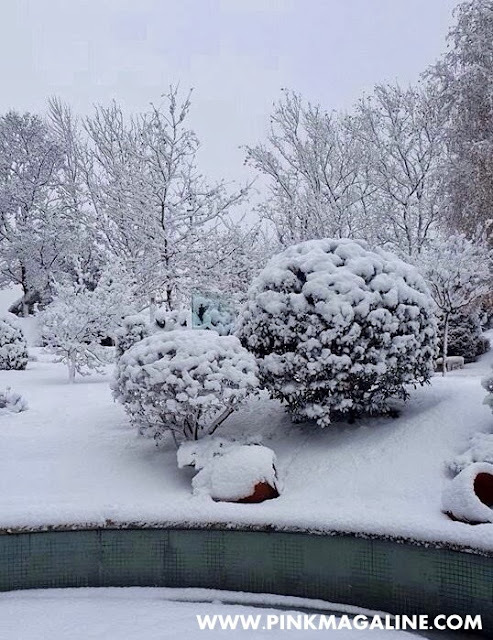 I see photos after photos of snow both in my Facebook timeline and in Instagram these days. 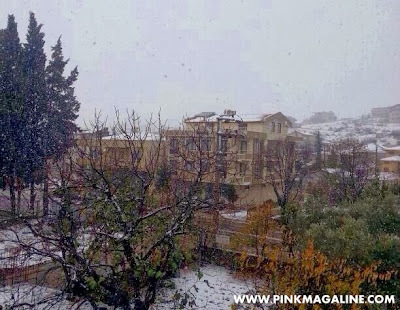 Indeed, snow came early this year. 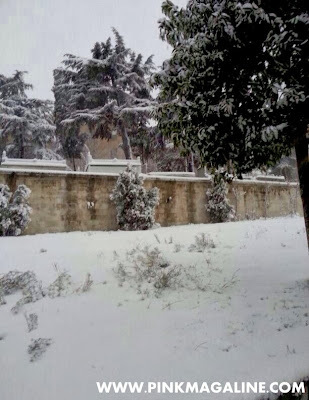 A brother-in-law just sent these photos and I was like, wow, it is really snowing already in Istanbul. Exciting but too bad we will miss it again this year. Actually, it is our elder daughter who wants to see it. 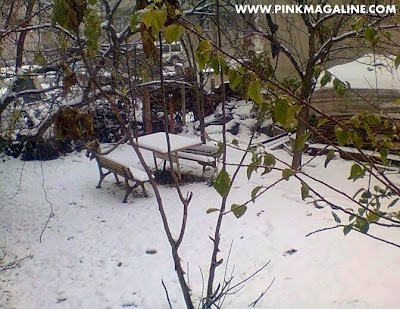 Snow already melted when we visited Turkey this April. We initially planned to visit a country that turns into a winter wonderland in February but the little one is too young to brave the snow. Not yet. So, I guess next year. We had a blast today at SM MOA Arena, watching the musical Barbie™ Live! The show started promptly as soon as we entered the event place. My two daughters, hubby and I enjoyed sitting at the VIP section, having a very nice view of the performers. Like I expected, there were fabulous stage props and pink accents everywhere. This is the part where Barbie plays Princess Victoria. My favorite part: The Princess and the Popstar. I took a lot of photos but sorry to say that I can't share all of them here. I think too much picture in a single post is not a good idea. Barbie™ Live! will be until December 15, 2013 at SM MOA Arena in Pasay City. if you have a daughter, you might want to consider purchasing a Barbie™ Live! ticket for her. I am sure it will pass as the best Christmas gift ever. 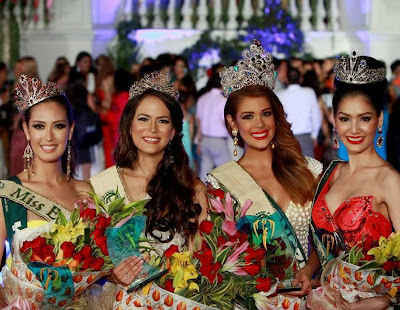 Congratulations Miss Venezuela Alyz Henrich for winning Miss Earth 2013! 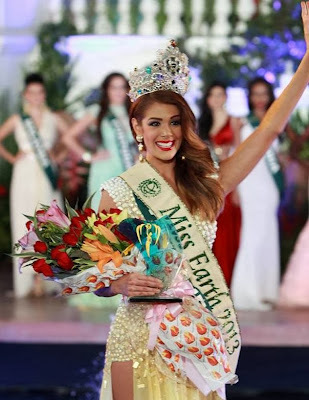 When I first saw Miss Venezuela Alyz Henrich in Instagram as tagged by Miss Earth Air 2012 Stephany Stefanowitz, I followed her immediately and I right away believed her capacity to take the Miss Earth 2013 crown. True to what I initially predicted, she won the title just a while ago. Congratulations Alyz Henrich! I think you deserve it!! From L to R: Catharina Choi of Korea (Miss Fire), Katia Wagner of Austria (Miss Air), Alyz Henrich of Venezuela (Miss Earth 2013) and Punika Kulsoontornrut of Thailand (Miss Water). When choosing a hotel room for a short vacation, what are the things that you consider first? Is it the size of the bed, the total ambiance of the room, or the rate per night? During my family's recent visit in Cebu, we were able to enjoy premier accommodation without having to pay extra at Shangri-La Mactan Resort & Spa. We originally booked a deluxe room but upgraded to a premier ocean wing room. Thanks to the kind hotel staff who ushered us and made our check in possible even at 9 in the morning. The 34 sqm premier room has decors in traditional and contemporary Philippine styles. Pardon me with the quality of the photos tho. I took them using my Cybershot DSC W300 in low light while the little one was having her afternoon nap. Didn't want to disturb her. The room is not as grand as the panorama room or presidential suite. Not richly decorated, no beaded chandeliers similar to what I saw at the lobby (for a sample photo Click here), and no panoramic view of the island. However, it's very homey and already conducive to relaxation. Hubby loved the media & entertainment amenities so much. The cable TV was huge and perfect for our viewing pleasure. Plus, the complimentary Wi-Fi and broadband internet access was fast. In fact, I was able to stay online in Facebook and IG all day and all night. Being a non coffee/tea drinker didn't stop me to enjoy the tea-making facilities. It's where I prepared my early morning breakfast cereal drink (regular breakfast was at Tides in a buffet setting). 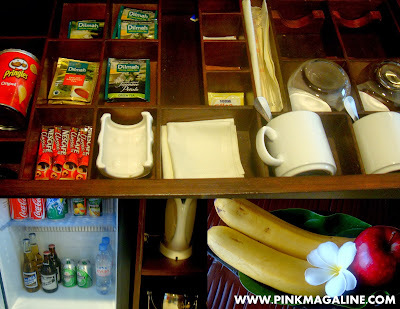 The small tray of fruits came free everyday as well as a couple of bottled water. I super liked the toilet and shower room which was equipped with hot and cold water. Awesomness with the L'occitane toiletries. Plus, there were other stuff that women might be needing in the shower like hairband, bath robe, shower cap, cotton pads, and so on. The private balcony with a coffee table and seating for two was overlooking a tropical garden. This is where I sipped my hot drink, feeling the morning breeze, and listening to the chirping of the birds, while the rest of the family was still sleeping. If I were to book a Cebu hotel again, I think I will be choosing the same accommodation. Our experience at Shangri-La Mactan is always wonderful. The staff are friendly and attentive and the place is world-class. 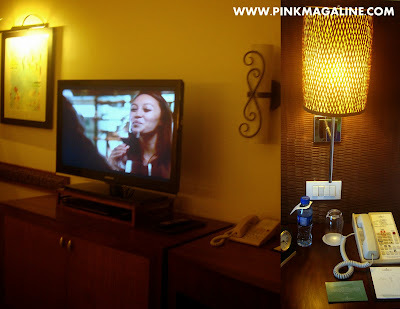 Note: An ocean wing premier room at Shangri-La Mactan Resort & Spa is around P15,000 per night. For more info, check http://www.shangri-la.com/cebu/mactanresort/.